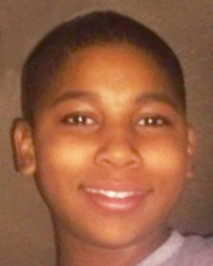 You are at:Home»In the News»VICE: Might there be justice for Tamir Rice after all? VICE: Might there be justice for Tamir Rice after all? Back in November, a 12-year-old named Tamir Rice was playing with a fake gun in a Cleveland park when a concerned citizen called 9-1-1. Although the caller noted that his weapon was “probably fake,” Officer Timothy Loehmann arrived on scene and shot the kid dead in two seconds flat. There are a few reasons this might have happened. A janky, outdated computer system in Loehmann’s cop car might have garbled that whole “probably fake” bit. Loehmann was immature and prone to meltdowns, in the words of a former superior. And, of course, in America it’s generally assumed that cops have the right to shoot when they feel threatened. Regardless, a Cleveland judge ruled Thursday that there’s probable cause for Loehmann to be charged with murder, Northeast Ohio Media Group reports. The news comes after frustrated citizens took to the streets at the end of May, when another cop, Michael Brelo, was acquitted of manslaughter in a shocking 2012 incident that saw 137 shots unleashed on an unarmed couple. The decision only came down after concerned citizens invoked a law that allows Ohioans to demand a warrant for another citizen’s arrest. On Tuesday, a group of eight clergy members and community activists with knowledge of the case brought affidavits to the municipal county court to charge Loehmann and his partner at the time, Frank Garmback, with aggravated murder, murder, involuntary manslaughter, reckless homicide, negligent homicide, and dereliction of duty. The judge said there was enough evidence to charge Loehmann with everything except for aggravated murder. He also said that Garmback, who was driving the police car that day, should be charged with negligent homicide and dereliction of duty. The judge has forwarded his opinion to city prosecutors and Cuyoha County Prosecutor Timothy J. McGinty’s office, which was itself about to present evidence to a grand jury. The citizens who demanded warrants wanted to bypass or at least accelerate that process, the New York Times reported, because of what they—and many police reformers—say is a double standard in how grand jury proceedings work for police officers and citizens. Essentially, in cases involving police shootings, prosecutors tend to present evidence suggesting the shooting was justified, instead of just their best arguments for an indictment as they normally would. That makes it really, really hard to charge a cop with murder or manslaughter. This is something we’ve seen in recent months with the cases involving the deaths of Eric Garner and Michael Brown (though the feds eventually decided that the latter probably did not have his “hands up” as the popular slogan claimed).